The Orders tab by default shows all orders in a data grid. The order grid can be filtered by account and also be toggled to show inactive / active orders. The order grid displays detailed information regarding the current day's orders. The grid is also active in that you can modify an order directly in it. The active order's State cell will be color coded for ease of use. 1.Modify the Quantity of an order by double left clicking your mouse in the QTY field for the order you wish to modify.You can increase/decrease the Quantity of an order by pressing the up/down arrow or scrolling the mouse wheel up/down. Holding the CTRL key will modify the Quantity in multiples of 10. 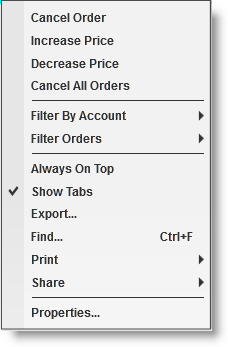 2.Modify the Price of an order by double left clicking your mouse in the Limit or Stop field. You can increase/decrease the Price of an order by pressing the up/down arrow or scrolling the mouse wheel up/down. Holding the CTRL key down will modify the order by 10 ticks. 3.Cancel an order by pressing on the "X" button. The limit price, if applicable. This column will display a zero for order types other than Limit or Stop Limit. The Stop price, if applicable. 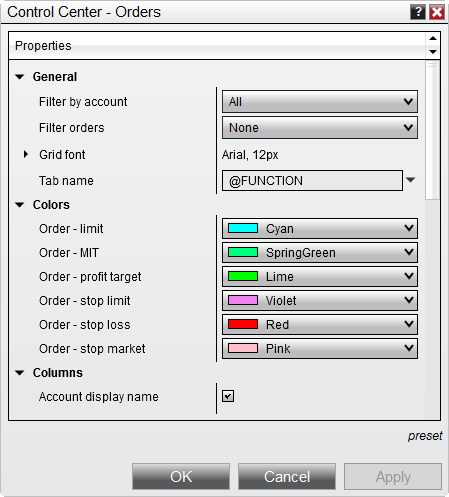 This column will display a zero for order types other than Stop Market, Stop Limit, or Market if Touched. The current order state. See the Order State Definitions page for a complete list of possible states and their definitions. The name of an order placed by an ATM or NinjaScript strategy. This column will be blank for orders submitted manually without an ATM strategy. The name of the ATM or NinjaScript strategy which submitted the order. This column will be blank for orders submitted manually without an ATM strategy. The One-Cancels-Other (OCO) identifier of the order, if applicable. Contains buttons which can be used to cancel resting orders. You can have multiple order grid tabs open at once, this gives you the ability to have multiple order grids visible open and have each one filtering for a different account. This gives you the flexibility to setup an orders grid for each account you have for example so you can keep them totally separate.